If we evolved on this planet, why does just standing up on it hurt us? Silver argues that the gravity on our home planet must’ve been stronger, and so we’re progressively growing taller and taller with each generation, causing us to have bad backs. It is thought, in the wider scientific community, that on planets with stronger gravity, human-like life forms would evolve to be much shorter and stockier to deal with the extra gravity bringing them down. When that gravity isn’t there, we apparently start to grow like forced rhubarb, ending up so tall and willowy that our own skeletons can’t support us very well. There could also be a counter argument that the gravitational pull on our home planet is, in fact, weaker, and the fact that our bodies will slowly bow to the pressure of Earth’s gravity over our lifetimes is proof that we evolved to deal with weaker gravity. As we grow older, we hunch over and even shrink, gravity slowly wears us down, starting with a crick in the neck and ending with a hunchback. Silver also wonders about the possibility that the food on this planet is more nutritious than on our home planet, causing a growth spurt. If we spent all our time back home chewing on tough, woody vegetation (yum), then were sudden plunged into a world of strawberries and fillet steak, it’s possible that all of those abundant nutrients made us shoot up like a 14-year-old boy who lives on McDonalds and Red Bull. In further expanding his argument, Silver points to the excessive nutrition on earth and a possible cause for the difficulties of human childbirth. The fact that humans have to spend hours screaming in pain to bring new life into the world, whereas the rest of the animal kingdom can drop a sprog in their sleep, has long puzzled anthropologists. Why is it such an ordeal for us to have kiddies when it’s literally our only biological purpose? Silver thinks that the high levels of nutrition that we get could cause our babies to grow far bigger in utero than our bodies are designed to cope with. Indeed, it is a well-known phenomenon that people with diabetes have much larger than average babies due to the high sugar levels in their blood – this demonstrates that there is, in fact, a clear link between high nutrition and baby size. Whether or not that means that diabetics are even more alien-y aliens than us regular aliens, Dr. Silver doesn’t specify. Perhaps this is also a result of our newer, willowy frames (thanks to the lack of gravity, remember?). Perhaps, back on our own planet, there are a load of stocky, troll-like beings happily squeezing babies out of their wide, childbearing hips left, right and centre. Ahh, it’s that classic summer scene. The moment there’s a little bit of sun, every spare bit of grass, beach or garden is littered with people turning gradually pinker. But why is that? Why does our own sun do us so much harm? This is one of Ellis Silver’s arguments for our alien origins. Humans will easily burn through sun exposure, whereas many creatures won’t. Humans, in contrast with other species, cannot sunbathe for more than short periods at a time without getting sunburned. This indicates that the human body is not effectively adapted to constant exposure to our sun, which is a funny thing for a species that have no protective layer of fur. Our own sun, from which all life on Earth draws its energy in one way or another, will literally give us cancer if we stay out in it too long, other creatures have evolved so that this doesn’t happen. A lizard, for example, can sit out all day and not get so much as a tan line and some corals even produce their own SPF to protect themselves. Silver thinks that this is because we evolved with a much weaker sun, or perhaps we originated on a planet with lots of cloud cover. Another thing that he highlights as odd is the fact that humans seem to suffer from seasonal mental disorders such as Seasonal Affective Disorder. Other animals migrate, hibernate or just tough it out when it comes to surviving an Earth winter, but humans just can’t seem to hack it. We can’t cope with a lot of sun, we can’t cope with a lack of sun – why are we so ill-suited to the comings and goings of the seasons if we’ve spent millions of years evolving on this planet? Right, so what’s the deal with this bipedal thing? How come everything else on the planet has remained perfectly happy with a low centre of gravity and sturdy base, whereas we wobble around on two legs? Perhaps it’s just because we’re looking at it from the inside, but you have to admit that we tend to stick out a bit. Two legs, extremely fine coat, hair growing out of odd places, opposable thumbs, huge heads, big, flat feet – we look much more like aliens than natives. Silver points to our lack pf body hair as a particularly odd feature of humans. It is necessary for humans to wrap themselves in the furs of other animals, just to stop ourselves freezing to death, even on the hot African plains where we are supposed to have evolved. The theory is that perhaps on our home planet, the temperature didn’t fluctuate so much between night and day and at different latitudes. Possible reasons for this could be a thicker cloud layer that insulates the planet (a bit like on Venus), a binary star system (so that the sun effectively never sets), or even that the crust of the planet is much thinner, allowing the heat from the molten core to come up through the ground. As a weird side note: Our relatively high levels of subcutaneous fat and almost total hairlessness, as well as our bipedalism, would actually make us excellent swimmers. Maybe we were some kind of race of semi-aquatic dolphin people on our home planet. The most conspicuously different feature of the human race, is just how much more advanced we are when compared to the rest of life on Earth. Why are we so far ahead of every other animal? It sounds like classic human arrogance, but for all our talk about how intelligent dolphins are because they can recognise themselves in a mirror – they didn’t invent the bloody mirror, did they? Okay, how about if we argue that inventing things like wheels and mirrors and social media executives isn’t necessarily an indicator of intelligence? It’s still drastically different to what everything else on the planet is doing. Why are we such outcasts from the natural world? It could be because it’s not our natural world. If we arrived on a primitive Earth with a head start, it could explain why we appear to be leaps and bounds ahead of every other species. Dr. Silvers also cites that fact that the “missing link” that would connect us with our common ape ancestors is still, er, missing (it’s not, but never mind). We could have come from a planet where a number of species were similarly advanced – perhaps that’s even the reason we left, to go and rule elsewhere. It all seemed to happen at once too. Evolutionarily speaking it took us fricking ages to get the hang of sharpened rocks, then, all of a sudden, we invented agriculture, writing, language, art, electricity, machinery, chemistry, quantum physics and pretty much everything else around us today. What the hell happened? One of Silver’s arguments is that the human circadian rhythm is out of whack with the actual day-night cycle on Earth. The circadian rhythm is the thing that regulates your sleeping and eating patterns. It means that you’re tired at night and awake in the morning and is the reason why you feel jet-lagged after a long haul flight. As the Earth’s day and night cycle lasts for around 24 hours (not including leap seconds because come on), it would make sense for our circadian rhythm to also be on a 24 hour cycle, but it’s not. Dr. Silver uses the argument that the human circadian rhythm is on a 25-hour cycle, meaning that it makes more sense that we should have evolved on a planet with 25 hour days. Unfortunately, Silver is wrong with the 25-hour figure, but not about the fact that it doesn’t match up. It used to be thought that our circadian rhythm was a whole hour off, turns out it’s actually anything from a quarter to half an hour off. This doesn’t seem like much until you realise that (providing you stuck to your natural circadian rhythm) it would only take you a month to potentially be 7 hours out of whack. That’s a whole night’s sleep for most people. This means that our home planet could have been slightly bigger than Earth, in order to have longer days (although, again, it’s not quite that simple), and so this also feeds into Silver’s theory that our home planet had slightly higher gravity. Evolution generally means that a species adapts to its environment, but we don’t seem to want to play that game. A big part of the theory comes down to the fact that we have altered the planet to fit us, rather than the other way around; we just can’t seem to bear living in the natural world. The fact that we have altered our environment so drastically makes it seem as though we’re just not suited to living in earth’s natural habitat. In fact, what we’re doing appears not to be evolving, so much as terraforming. Another of Silver’s arguments is that we’re seemingly terrible at reading our own planet. Many animals have built-in sensors for natural phenomena such as earthquakes, tsunamis and even just the ability to predict the weather, whereas we have had to intervene with our technology in order to keep up with them. It could be that we came from a planet that is not so geologically active, meaning that there would be no benefit for us to be able to predict earthquakes. Then, we have the fact that we can’t eat most of the food on this planet without altering it in some way. Whether it’s by cooking it, or through selective breeding, most of the food that we eat is not as nature intended it. We’re not saying that our home planet had hamburger trees and rivers of lemonade (if it does then book us a one-way ticket to Alpha Centauri), but that fact that most animals, apart from us, are perfectly fine eating grass and raw zebra is a bit weird. Humans are spreading, and they’re spreading fast. As of 2015, there are over seven billion of us crammed onto this tiny little planet and the number is always going up. Not exactly a balanced eco-system. It’s almost as though we’re an invasive species. What happens when you introduce a new species into an environment that they did not evolve in? A lot of the time, they take over. This is due to the fact that they do not have any natural predators and the local fauna are not equipped to defend themselves against them. This means that the non-native species has free reign to hunt, eat and breed, with the potential to decimate the local environment. This does sound an awful lot like how we interact with the natural world. We’re so far up the food chain, that we don’t even feature as the apex predator in it, we actually exist outside of earth’s eco-system. It does seem to scream foreign species. Even with other invasive species, the ecosystem will ofetn find a way to restore istelf back to normality. With “normal” imbalances in nature, that balance can be quickly restored as the food runs out, and the invading species will quickly begin to reduce in number again. This doesn’t appear to have happened to humans so far. Perhaps, when the resources finally do run out, we’ll go the way of many other species and simply become one rogue algea bloom in the long natural history of the planet. One of Dr. Silver’s slightly more esoteric theories is that the Earth may actually be a prison colony for a society of galactic beings. It is apparently our naturally violent, vengeful, lustful, criminal natures that makes him think this. The fact that you don’t often observe this kind of behaviour in the animal kingdom makes Silver think that it could well be because these are traits that come from a completely different race of people. The theory is that we could have had our memories wiped and been dumped in a primitive backwater by a civilisation of space-faring beings as a sort of “cooling off” period, presumably after becoming too much of a menace to intergalactic society. Perhaps they hoped that we would integrate with the natural world on a young planet and become a peaceful race of hunter-gatherers, or something. But actually what happened is that we almost immediately wiped out the Neanderthals and set about transforming the Earth to suit our anti-social ways, so they left us here. To be fair, given our earthbound history of shipping criminals off to somewhere out of sight and out of mind, this does sound like exactly the sort of thing we’d do if we ever became a planet-hopping race of pan-galactic beings. The question is, has it already happened? 2. So Where Did We Come From? In order to figure out our origins, Dr. Ellis Silvers then takes us through the practicalities of colonising another planet, and he’s certainly given it a lot of thought. 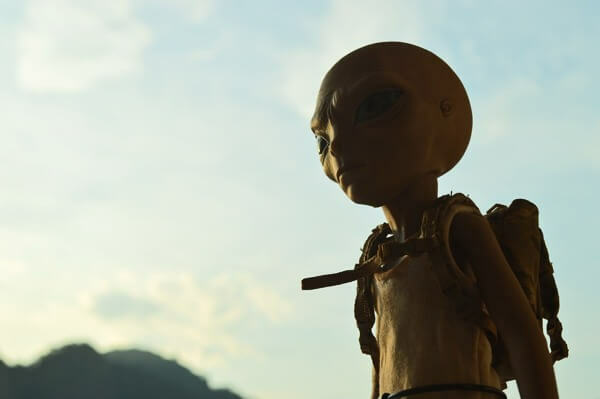 So, if we presume that this ancient race of humanoids has developed the technology to travel at near light speed, they would need to originate from somewhere that can be travelled to within a human lifetime. Say, 30-ish light years away. Silver reckons that these early settlers could well have brought frozen embryos with them to kickstart the whole breeding process, as they would have been elderly by the time they arrived (although this does sort of ruin the whole “Earth is a space prison” thing). Dr. Silver then goes on to list his top picks for our potential homeworld, including Alpha Centauri A and B (1 lightyear), Epsilon Eridani (10.5), 61 Cygni A and B (17), Epsilon Indi (20) and Tau Ceti (22). Do let us know if one of those names stirs something primordial in you, it could be the proof we need. The Alpha Centauri binary system eventually claims the top spot due to its proximity and the fact that it’s a binary system (remember our earlier discussion about the sun that never sets?). It would mean that, at even a fraction of the speed of light, it would still be reachable within one lifetime. Although, fair-minded as always, Dr. Silvers also allows for the idea that a race of galactic beings could well have harnessed the use of hyperspace and wormholes in order to reach our humble little Earth from pretty much anywhere in the universe. So that doesn’t really narrow it down.